This project was developed in 2014 by GHHS chapter members at the Icahn School of Medicine at Mt. Sinai. In 2015, over 85 GHHS chapters and health care facilities throughout the US and Canada participated in this easily implemented project. What has been most meaningful to you? 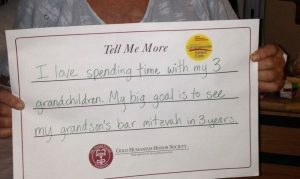 Patients lit up when asked about their personal lives. Students were awed by the depth and resiliency of the patients they interviewed. Everyone who entered the room – from residents, attendings, and nurses to food service, other support staff and visitors – were able to see those signs and remember that each patient is a unique individual.